I was in college when I finally took the plunge. Science fiction was supposed to be the cool thing that the intellectual elites at college used to read. I of course did not belong with them but I was attracted to the things they did and spoke of. One day, when I was sitting in the hostel common room, pretending to read the newspaper, but actually eavesdropping on a conversation between two of these intellectual elites, I heard the mention of this science fiction series called 'Foundation'. Somehow I liked the sound of the series and immediately rushed to the hostel library to look for it. ‘The Second Foundation’ was the only book from that series available. So I picked it up. The book started with a conversation between someone called by the strange name of 'The Mule' and one Bill Channis. Things were happening right from the word go and initially it did seem slightly disorienting. But the narrative was gripping - I just could not put the book down.I sat through the night and completed it. At the end of it, I was a convert. There was no looking back from there. I went on read all books by Asimov I could lay my hands on and then moved on to other science fiction authors as well. One book by this Master was all it took to pull me lock, stock and barrel into the fascinating world of science fiction. That was the power of his writing. Coming back to the book ‘Second Foundation’, it has a highly engaging story line. The book actually has two stories. The first story tells us of how a secret group called ‘Second Foundation’ defeats the mutant who rules the universe through his manipulation of people’s emotions. The second story takes us through 'Second Foundation'’s face off with its sister group ‘The First Foundation’. I was curious to learn more about these 'Foundations'. So I picked up the two earlier books in the series – ‘First Foundation’ and ‘Foundation and Empire’. The first tells us how the first Foundation manages to establish itself and survive in a hostile environment in the fringes of the universe. The second tells the story of the Foundation's defeat of the Galactic empire and establishment of its rule over the universe only to be itself overthrown by Mule, the mutant. Then I moved on to the fourth book ‘Foundation’s Edge’ where the two foundations once again take on each other in a triangular standoff with a new mysterious all powerful entity emerging as the third leg of the conflict. Then I picked up the books ‘Prelude to Foundation’ and ‘Forward the Foundation’ that give us the backstory of how Hari Seldon formulated the science of psycho-history. The last book of the series - ‘Foundation and Earth’, which I happened to pick up many years later, establishes a link between the world of 'Foundation' and a series set in a much earlier time in galactic history. It is a fascinating book for an ardent fan of Asimov as it is a key link in his attempt to connect all his series and establish a continuous future history starting from our current times all the way up to the distant future where 'Foundation' series is set. But the story line in the book as such is weak and at times the linkages he tries to establish seems contrived. Most of the books I had read earlier spanned over periods not exceeding a few years. The longest one I had read till I started on 'The Second Foundation' was Robinson Crusoe that ran over several decades. But all that changed once I get into science fiction - we were no longer talking of years and decades anymore but centuries and millennia. The Foundation series is written like a history of the future running over centuries. When a story runs over many lifetimes, individuals begins to fade into insignificance. The interest shifts towards the future of humanity as a whole and the development of big ideas. It is like the experience of being taken up a tall tower and shown the world from there for the first time. Doesn't that change one's perspective completely? Now imagine doing the same thing in the dimension of time. That is the feel one gets by reading such stories. For a first time reader of science fiction this can be a really humbling experience. This book does not go too much into technology as one would expect science fiction to. Nor do we have the usual elements that come to one's mind when a novice thinks science fiction - robots ,aliens and time travel for instance. Space travel and blasters are there of course but they are just there as a matter of routine as trains and guns are in a contemporary crime thriller. Nowhere are we told how any of these work. The real focus of the story are the sociological and political aspects. Purely as a story, it is quite a page turner. There are few good fights, chases, mental games and political intrigues. While the focus is not on individuals, every now and then one of those real big legendary characters who tend to leave an indelible mark on history pops up - the Mule, Salvor Hardin, Hober Mallow, Arkady Darell, Bayta Darell and the great Hari Seldon himself to name a few. Unlike characters in mainstream fiction with who the readers can relate at a personal level, the ones here are more worthy of hero worship and adulation than empathy. Unlike many of the other works of science fiction, this is not a very difficult book for a science fiction neophyte to get into. Works like Dune can intimidate the reader by the sheer complexity of the world building while a reader without passion for science and technology may find the technological details too dense in Arthur C Clarke's works. The Foundation series has neither of these characteristics and is quite an easy read. However to really appreciate the series, one must have interest in conceptual aspects of subjects such as history, politics and social science. Purely as a story, it might interest the more analytical types who have fondness for puzzles, strategy games and such. Thanks Suresh. Somehow everyone starts with Asimov but unfortunately end with Asimov. Many just wax eloquent about Asimov without probably even reading him. Would you also include works by Jules Verne - for he laid the foundation for most of the wondrous things that have since been created! to be honest and I think I am being repetitive again I was never a SF Fan, notice the word was but recently I have gathered all my wits and bought Issac Asimov, lets see how it goes. Good to know Asteria. Which book have you bought? There was a time when I was totally gripped by Issac Asimov's fiction. I believe he managed to wipe out at least 12 months of my life, so engrossed was I in his books! The Foundation series, to which he added sequels and prequels, fit in the larger scheme of his Robot and Empire series. I didn't quite like the conclusion, however.You would also like 'Caves of Steel' etc. Yeah, Mr. Umashankar. I too spent years dreaming of becoming a psychohistorian. I have read Caves of Steel and one more in that series. I think one I have not read. After I read that, I might review the robot series as well. Even I did not like the conclusion much. Yeah - Prelude is not a good book to start. If you have read the main 3, Seldon is like a God and it is interesting to see him more human in prelude. Quite an engaging read, Karthik; especially so if you are an SF fan. Clarke was never a favorite but I did like his 2000 Space Odyssey series. Rama though was a disappointment, a major one at that. I started my SF journey with the incomparable 'Doc' Smith, the pioneer of space opera and who I guess was the inspiration behind the Star Wars series, so it was an easier 'launch' for me. 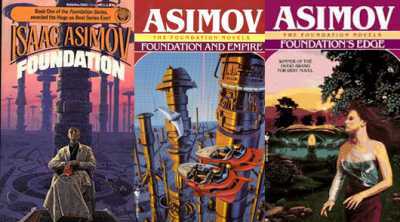 Asimov's Foundation series is a perennial favorite--A circle has no end, the characters Bliss, Pelorat, Trevize, the concept of Gaia--all these made this Hugo winning series one I particularly had a great time reading. I must say I didn't find the prequels all that interesting though. All in all, a great post, thank you! Thanks Ramesh. Yeah - Odyseey is better. Doc Smith I have read few but yet to complete Lensman series. But plan to complete Lensman series and post a review. Circle has no end was an amazing puzzle, no? Often prequels and sequels fail to create magic of original series - their main purpose I think is to milk the nostalgia of the fans for the characters and settings.